The base directory is https://bankontology.com/br/ Below is a list of Ontology files in this site. Just right-click on the filename to download or copy the link into your ontology editor. 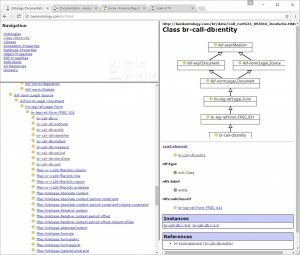 form/ Call_Report_Taxonomy.ttl ffiec-cr-taxon A configuration ontology file to include all Call Report concepts, formulas, abstract presentation elements, and various linkbases. Call_Report_v129.ttl ffiec-cr-v129 Classes and properties of Call Report abstract presentation elements, edit results, edit codes and edit excuse text. Call_Report_v129_calc.ttl ffiec-cr-v129-calc The Calculations linbase extends links between concepts to express calculated values. Call_Report_v129_cap.ttl ffiec-cr-v129-cap A linkbase of Captions (labels) for MDRM an Presentation concepts. Call_Report_v129_def.ttl ffiec-cr-v129-def The Definition linkbase lists all MDRM elements for a particular Call Report taxonomy. Call_Report_v129_ec_mess.ttl ffiec-cr-v129-ec-mess Edit Check Messages are used to associate a an error text with a particular edit. If the check fails, then the message shows in the error report. Call_Report_v129_ec.ttl ffiec-cr-v129-ec Edit Checks validate the consistency of a filing. Call_Report_v129_intr.ttl ffiec-cr-v129-intr The ontology with instructions for Call Report items. Call_Report_v129_pres.ttl ffiec-cr-v129-pres The instantiation of the Presentation Linkbase composes the actual forms from Micro Data Repository Items. Call_Report_v129_ref.ttl ffiec-cr-v129-ref The reference linkbase contains the relationship between a concept (both MDRM and abstract presentation concepts) with a resource element (that contains the report name, schedule name, line number and column name). FFIEC_concepts.ttl ffiec-cep Classes and properties for Micro Data Reference Manual (MDRM)1 concepts that occur in a Call Report. FFIEC_instance.ttl ffiec-inst A FFIEC extension to XBRL instance to restrict Non-Negative values. 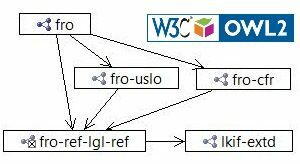 FFIEC_linkbase.ttl ffiec-linkbase An ontology file to extend the XBRL Linkbase. FFIEC_mdr-schema.ttl ffiec-mdr-schema An ontology version of XML Schema specific to the FFIEC Central Data Repository system. XBRL_instance.ttl xbrl-inst An OWL version of the XBRL instance XSD. An instance document is a collection of facts that together make up a business report. XBRL_linkbase.ttl xbrl-linkbase An OWL representation of the XBRL Linkbase. Linkbases are XML documents that provide additional information that forms part of the concept definitions. XBRL_XLink.ttl xbrl-xlink An OWL version of XBRL extension of the W3 XLink standard. ref/ Bank_Legal_Reference.ttl br-leg-ref Bank specific financial reference data. The diagram shows the include graph for the Call Report taxonomy files.